WHO IN THE MAINSTREAM MEDIA COVERED JOE ARPAIO'S PRESS CONFERENCE? The story is on Drudge, it on the Blaze, it was on the AP newswire, CBS News Yahoo News, the New York Daily news, MSNBC, most if not all the local Arizona news stations, are carrying it. Only CBS of the "big three" covered the Press Conference, and FOX news has also carried the story. I have not found the story from the NY Times or the the Washington Post. The Blaze story seems fair to me. MSNBC has run purely a hit piece of the investigation. The local news stories, of what I have seen have, all in all been fair. The Fox News story is short, but fair if not bland and can be found on their home page, unlike CBS in which you will have to hunt, at least today to find it. Go here if you want to read about the 6 new things Arpaio investigation discovered. I guess this is better than a sharp stick in the eye. 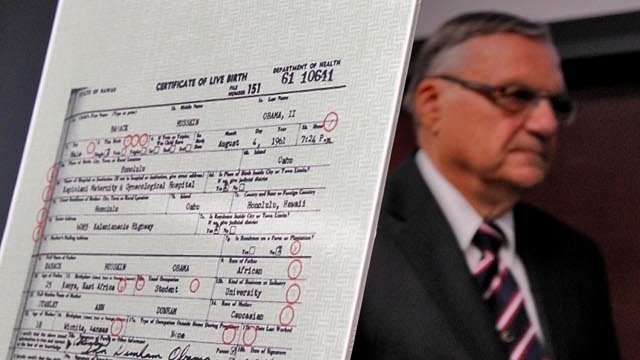 Now it will be up to WE THE PEOPLE to PRESSURE CONGRESS to investigate both the discrepancies of which they are major, and the laws in Hawaii that let virtually anyone obtain a birth certificate. -W.E.